Time for another Six Degrees of Separation. Each month a book is chosen as a starting point and the idea is to link it to six other books to form a chain. The links can take any form: similarity of themes or setting; written by the same author or winners of the same prize. The basis of the link is really limited by nothing more than our imagination. This month we begin with a favourite novel of mine, Atonement by Ian McEwan. It’s set in a large country house in England between the two World Wars. Events are triggered by the actions of thirteen-year-old Briony who has a vivid imagination. Her accusation about an event she witnesses one hot summer evening has life-changing consequences for her elder sister and the boy with whom she is in love. For the rest of her life she regrets her actions. I’ve read the book twice and seen the film multiple times and still can’t make up my mind whether Briony is a minx who deliberately misconstrues the event. For another minx who likes to meddle in other people’s lives let’s turn to Emma by Jane Austen. Though many in her village think she is charming, Emma is a girl who has been indulged throughout her life and ends up thinking she knows best for herself and everyone around her. She loves nothing more than a little matchmaking, thinking she is doing this for the best of the parties concerned but ends up causing more harm than good. In the league of schemers however Emma is small fry compared to the most wonderful character in the next book in my chain. Obadiah Slope in Anthony Trollope’s Barchester Towers is a master manipulator, a man who hides his monstrous ambition for wealth and prestige under a cloak of piety. Lest you think that devious behaviour and trickery are confined to England, the third book in my chain should convince you otherwise. John Steinbeck’s Cannery Row gives us a lovable bunch of rogues, chief of whom is Mack. Steinbeck describes him as “the elder, leader, mentor, and to a small extent exploiter of a little group of men who had in common no families, no money, and no ambitions beyond food, drink, and contentment. It’s Mack who comes up with a way to say thanks to their friend Doc, who has been good to them without asking for reward. The entire community quickly gets behind his idea of a thank-you party. Unfortunately things get out of hand and Doc’s home and his lab where he studies and collects sea creatures from the Californian coast are ruined. The novel is shot through with nostalgia and sadness (there are three suicides) but also has its humorous moments. By far the funniest episode in the book is when Mack and the boys embark on an expedition to collect frogs for the Doc. Of course it all goes horribly wrong. Collections of sea creatures reminds me of All the Light We Cannot See by Anthony Doerr. I wasn’t all that enamoured by it but it was highly rated when it came out a few years ago . I seem to remember it was one that the then President Obama took on his summer holiday. It’s the tale of a blind French girl and a German boy whose paths cross in occupied France during World War II. Marie-Laure, blind since the age of six, take refuge from the war in St Malo. There the girl’s imagination is fired by the marine life described in her Braille edition of Twenty Thousand Leagues Under the Sea and she becomes a collector and expert on molluscs. Most of her collectables don’t sound edible although the principal character in my next chain, The Gourmet by Muriel Barbery, would probably disagree. Now before I turned vegetarian about a quarter of a century ago I was quite partial to duck. But I disliked the sweet sauces in which it was often served. Remember duck a l’orange or duck with blackberry sauce? I’ve no idea what you’d get if you ordered any menu item “à la Jamaïque” – even a Google search can’t provide an answer (it appears to be the title of a French musical). But I can’t begin to imagine that grapefruit and duck are meant to be companions. But then I am decidedly not a gourmand. Nor would I want to be if it involves the kinds of concoctions beloved by the central character in my sixth and final book: Iris Murdoch’s Booker-prize winning novel The Sea, The Sea. Charles Arrowby, retires to the country after highly successful career as a London stage director. In his tumbledown seaside cottage he swims, writes his memoirs and concocts some rather bizarre meals. The kidney beans/tomatoes/celery/oil and lemon juice combination sounds interesting and I might even be tempted to try that one day. But what they are doing on the same plate as baked beans is completely beyond my comprehension. All this talk of food is making me feel peckish. Time to wrap up the chain and head for the kitchen. The supermarket was completely out of edible molluscs on account of the fears about post-Brexit catastrophe amongs the bivalve community. So it will have to be beans on toast again. Oh wait a second, bread is in short supply because everyone is stocking up for the inevitable shortage in December. Right well it’s just cup a soup then…..
It’s time for another attempt at #6Degrees of separation. I chickened out of last month’s chain because I didn’t know the starting book and my creative juices were not flowing. Lets hope I fair better this time. We begin with Kazuo Ishiguro and Never Let Me Go –a dystopian science fiction novel published in 2005. I’ve not read it. I have a copy on my TBR but am not sure I will ever get to read it since I don’t really ‘do’ sci fi. It’s certainly got pedigree having been shortlisted for the Booker Prize that year and included in Time Magazine’s 100 best English-language novels published since 1923. I don’t know how you feel about lists like this. Do you immediately begin checking off how many of the novels you’ve read or do you start questioning on what basis the list was constructed. The ones that irritate me the most are those that include words like ‘should’ and ‘must read’. Who are these people to tell me what I should and should not read. I will make up my own mind thank you. Digging around for info about Never Let me Go I discovered the title comes from a fictional song on a cassette tape by fictional singer Judy Bridgewater (you can read more about this here). Many novelists use the inter-textuality approach when choosing their book titles. One of them is Madeleine Thien who has just won Canada’s Governor General’s Literary Award for fiction with her novel Do Not Say We Have Nothing (a novel I thought outstanding and deserved to win the Booker prize this year). Thien takes her inspiration from an adaptation from the Chinese translation of the L’Internationale, the 19th century song adopted by socialist and worker groups worldwide. “Do not say that we have nothing, / We shall be the masters of the world!”. This was one of the first books we discussed when I joined a book club in 2013 and was a good example of how your perceptions can be changed. When someone suggested reading it I groaned – Steinbeck in my brain was someone whose work I had tried – and failed – tor head in the past. I thought him ‘gloomy’ and ‘slow’. Of Mice and Men was a delight however. It was poignant rather than gloomy and on the strength of that experience I went onto read the equally delightful and unexpectedly funny Cannery Row. Of Mice and Men has been a frequent target of censors who consider it vulgar and racist so it’s banned from some school systems in the USA. In the UK however it’s a popular choice on the school syllabus and has been a highly successful stage play. And so with censorship we come to my next link…. I simply don’t understand this clamour to ‘ban’ books. It seems prevalent in USA but not confined to that part of the world. My next book in the chain was the subject of huge controversy in the 1960s. Lady Chatterley’s Lover by D.H Lawrence was published privately in 1928 but a full unexpurgated edition was not published openly in the United Kingdom until 1960, when it became the subject of a landmark trial for obscenity. The publisher Penguin won the case, and quickly sold 3 million copies.I read his ‘greatest hits’ (including Sons and Lovers, Women in Love and The Rainbow) and though I’ve still got my old Penguin editions of his books, I can’t say he was one of my favourites authors. For decades Lawrence was required reading on university literature courses though by the time I got to university he was already on the way out. Today he barely gets a mention in those lists of top 100 novels and books you must read. Henry Miller is another author whose work was once controversial but like Lawrence, seems to have slipped out of public consciousness – at least he has in the UK, it might be a different story in USA. I read Miller while still at school and during my phase when I went out of my way deliberately to read challenging books. Tropic of Cancer and the later Tropic of Capricorn will forever be associated in my mind with the summer of 1973 when I spent the whole summer getting a sun tan in the garden and reading ‘serious’ authors like Sartre, Camus etc. Tropic of Cancer was a bit of escapism for me with its depiction of life in a community of bohemians in Paris. It didn’t matter that what Miller often described was squalor and the cold indifference of the city’s inhabitants, for a teenager living in a small mining town in Wales, it still sounded amazing. Squalor, poverty, loneliness, Paris – what book do those words conjure up for you? For me there is an obvious link to a writer known for his vehement opposition to social injustice. And so we get to my next link. This was the first full-length work published under the pen name of George Orwell. Orwell, or to give him his birth name Eric Blair, had gone to Paris in 1929, living in the trendy Latin Quarter along with people like Ernest Hemingway and F. Scott Fitzgerald. At some point he had his money stolen. Whether out of necessity or just to collect material for an essay, he took on casual work as a dishwasher in restaurants. He turned his experience into “A Scullion’s Diary” but it was rejected by Cape. He then added the London section and tried to get Faber & Faber to publish it – only to get the rejection from T. S Eliot who was the editorial director. The book didn’t get published until 1933 but though it had a positive response from other writers, it was another six years before the general reading public began to take an interest in Down and Out in Paris and London. Multiple rejections but then roaring success is the link to my final novel. J. K Rowling is now one of the wealthiest authors in the world with an estimated fortune of around £600million. But the book which set her off on the journey to stardom almost didn’t get published. Her agent spent a year touting it around the London publishing houses only to get rejection after rejection – a lot of the editors thought it was too long for child readers. It wasn’t until it got into the hands of Bloomsbury’s chief executive Barry Cunningham, that it attracted attention and that was only because, before reading it, he gave it to his eight year old daughter. When she told him it was “so much better than anything else” that he took a closer look and decided it would fit within a portfolio Bloomsbury was creating for children’s literature. He paid Rowling an advance of £2,500. The initial print run of 500 copies in 1997 didn’t indicate Bloomsbury was that convinced. But the book began getting favourable reviews and then won a National Book Award and a gold medal in the 9 to 11 year-olds category of the Nestlé Smarties Book Prize. The following year, Philosopher’s Stone won almost all the other major British awards that were decided by children.Within two years sales had reached 300,000 and the phenomena of Harry Potter was underway. From Never Let Me Go to Harry Potter; from science fiction to fantasy via connections I would never have expected to make. It’s been fun finding those links. You can join in the fun with this monthly meme hosted by Kate at the Books Are My Favourite and Best blog. The last emotion I expected to experience with a John Steinbeck novel was laughter. My first encounter with him (Grapes of Wrath) hadn’t given me the impression he was anything other than depressing. So I resisted him for years. It was not until I joined a local book club who just happened to be reading Of Mice and Men that month, that I got an inkling that I’d misjudged the man. True it wasn’t very uplifting but there was a sense of warmth and affection in his characters and tinges of humour mingled with the dispiriting nature of their predicament. Not quite ready to do battle with Grapes just however, I opted for the much shorter novel Cannery Row. It brought tears to my eyes, not of pity but of joy resulting from Steinbeck’s ability to wrest humour out of the most unlikely circumstances. The is a novel which doesn’t have much of a plot. 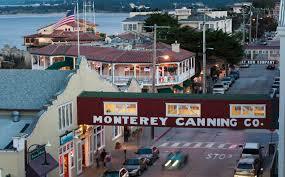 It’s more a collection of episodes about the people who live in the sardine canning district of Monterey, California. Today this is a small area crowded with tourists who swarm in and out of souvenir shops and food outlets. In Steinbeck’s novel, Cannery Row is populated mainly by working-class people and a group of down-and-outs who live from one drink to another, begging, borrowing, stealing and fighting. Their ringleader is the charismatic Mack, a man who if he put his mind to it would be smart enough to get a good job. But he prefers to lounge about on the fence, drinking a cocktail of slops from a local bar and doing odd jobs. He does however recognise a good turn when it comes his way. And no-one has been kinder to him and ‘the boys’ than Doc, a gentle, cultured man earning his living as a marine biologist. Mack hits on the idea of trying to do something nice as a thank you for Doc: a surprise party. Overcoming their first problem (a lack of money to fund the venture), they set about the plan with gusto. Of course it all goes disastrously wrong causing extensive damage to Doc’s laboratory. Most people would have just given up at that point, but Mack is a resilient guy. He decides the only way to make amends is to throw another surprise party……. Is this any more successful? You’ll have to read the book to find out. By the end of the book, nothing has really changed. The characters go on living exactly as they have, good-naturedly co-existing within the community, through natural wit, innate goodness and genuine sense of community. Look at them. There are your true philosophers. I think… that Mack and the boys know everything that has ever happened in the world and possibly everything that ever will happen. I think they survive in this particular world better than other people. In a time when people tear themselves to pieces with ambition and nervousness and covetousness, they are relaxed. All of our so-called successful men are sick men, with bad stomachs, and bad souls, but Mack and the boys are healthy and curiously clean. They can do what they want. They can satisfy their appetites without calling them something else. Reflective at times, black comedic at others, this is a novel that seems to look fondly back to a time when Steinbeck believed life was somehow simpler; a time when people could survive without money valued more for their companionship and the goodness of their hearts than the thickness of their wallet. A little sentimental perhaps, maybe even naive but writing in the aftermath of the Great Depression and World War 2, it’s hardly surprising that Steinbeck del that his world had seen better days. Hearing the news that my book club had decided to read John Steinbeck’s novella Of Mice and Men, I admit I didn’t quite manage to stifle a groan. My previous (and only) encounter with Steinbeck had not been a happy one so the thought of a second meeting was not one to relish. Having tried but failed to get enthused by The Grapes of Wrath, I had formed the impression that all of Steinbeck’s work would be similarly dark and depressing. I was completely unprepared for a book which reverberated with warmth and understanding and that packed so many ideas into just over 100 pages. Of Mice and Men is essentially a parable about dreams and the obstacles that stand in the way of achieving them; a story about people who are life’s losers yet never relinquish their hopes and ambitions for a better life. The two central characters are George Milton and Lennie Small, migrant workers who drift around California in search of work. When the book opens they are on their way to a ranch where they are due to start jobs as agricultural labourers. These are not people who have grand ambitions; all they really want in life is a place they can call their own. They begin their journey full of optimism that their endeavours will help them realise their dream of owning their own farm and being in control of their own destiny. Someday we’re gonna get the jack together and we’re gonna have a little house and a couple of acres an’ a cow and some pigs…. …we’ll have a big vegetable patch and a rabbit hutch and chickens. And when it rains in the winter, we’ll just say the hell with goin’ to work and we’ll build up a fire in the stove and sit around it an’ listen to the rain coming down on the roof. 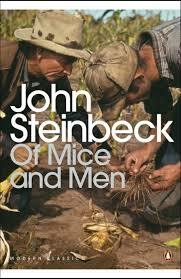 Steinbeck portrays George and Lennie as innocents caught like mice in a maze of modem life. Lennie in particular is depicted as a simple soul, a man who loves soft creatures and who never tires of hearing his friend tell the story of their future life together when they will – in Lennie’s words “live off the fatta the lan”. Though Lennie can’t retain practical information for very long (he doesn’t even remember where he and George are going tomorrow), the story of their future life is one he’s heard so many times he can practically repeat it word for word. Lennie in essence is a simple-minded man of great size and strength. But he has a flaw in his character that will ultimately cause a tragic accident and the collapse of their dream. Though all does not end well for this pair, what Steinbeck succeeds in showing is that dreams are what sustain us. Without them, life is an endless cycle of days without meaning. Without someone to share those dreams, they become empty of life and vitality. Ultimately, the ties of affection and love between the two men are what bind them together. They may have nothing of material value but they do have each other helping to keep alive the flame of their desire and hope. George was quiet for a moment. ‘But not us,’ he said. A delightful novel even if at times it has a sense of inevitability that is unwelcome.